In a sentimental mood: Killer! I just don't have enough good things to say about this CD, I mean, hell, you got to to run down and buy this bad boy today. I dunno which song I like better, there is not a dog among them and Jerry Lee rocks the house start to finish. 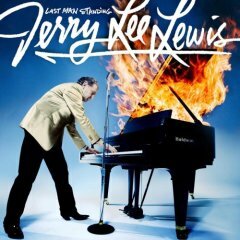 Word is Jerry Lee has more material waiting for release including an upcoming gospel album. I can hardly wait. Out of all the members of Sam Phillips' "Million Dollar Quartet" no one would have bet on Jerry Lee being the last man standing . . . literally. Y'all go get this and rock your world. You DO remember you have a blog, right?